The Freefly MoVI M5 accessory that on-the-go cinematographers love most is the MōVI Ring. 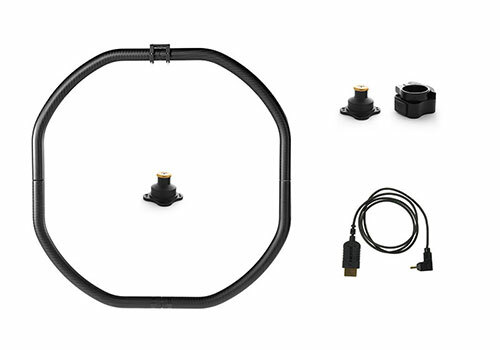 This bundled accessory offer starts with the MōVI Ring, but also adds the Toad in the Hole Quick Release, Male Toad Adapter, and a Right Angle HDMI cable. A savings of $210 compared to buying each item individually! The MōVI Ring is a lightweight, rigid carbon fiber frame designed to provide additional points of contact for an operator holding the MōVI M5, M10, or M15. The MōVI Ring can either mount directly to the MōVI M5, M10, or M15 but also works in combination with the Toad In The Hole accessory. The Toad In The Hole Quick Release is a sleek, lightweight, low-profile quick release unit, which provides an easy mount and release solution for your MōVI. It allows the operator to remove the MōVI from the handle assembly and attach to any other method of filming carrier, such as a crane, jib, or car mount (with a Toad installed) in a matter of seconds. Fiddling around with alignment is not required when engaging the Quick Release - just attach and rotate to the desired angle (from 0-360°) for shooting. The Quick Release uses a clamp to secure the MōVI. This clamp, along with the secondary release button, are used to release the MōVI. The new, super-flexible Freefly Right Angle Mini HDMI to HDMI Cable is designed to send an HDMI signal from a camera with Mini HDMI Out to a monitor on the MōVI's top handlebar without the stiffness and weight of a traditional HDMI cable.